The Literary Wall at Rathmines Library is a wonderful illustration of the township’s rich literary heritage. Of course it can never be complete, but there is one name that ought to be there, Pearse Hutchinson. And maybe it’s partly because he was as far away from being self-promotional as one could be. One look at him: grey bearded, wearing black beret and coat, even indoors, was enough to see that he did not belong to the mainstream body of poets. He was proudly nationalistic, a staunch supporter of the left, the small nation, underdog, the oppressed, the worker. His poetry, often centred on a small detail, would elucidate a huge truth behind it. He drew attention to injustices and inequalities, he had experienced them directly in Ireland and in his ten year’s living in Franco’s Spain. Even through wearing a beard, he had experienced antagonism and discrimination in a time when beards were associated with certain groups in society. 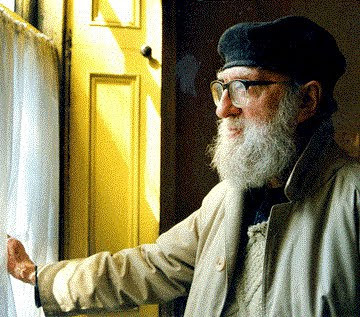 One of Ireland’s finest poets, he was a great supporter of, not just the Irish language, but all minority languages. He knew the central position of language to nationhood. He was much admired by poets and writers from around the world, particularly those who championed the cause of oppressed peoples. His worth has not yet been fully appreciated, but time will mend that.